Dr. Mohammed Alfarhan has over 20 years of research and development experience. 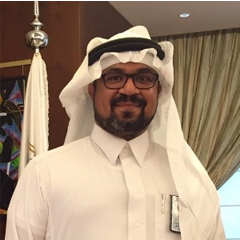 Before joining RSL at CPG team in February 2018, he was the Manager of National Center of Remote Sensing Technology at King Abdulaziz City for Sciences and Technology (KACST); he worked at Oil and Gas Research Institute, National Center for Environmental Technology, and Natural Resources and Environment Research Institute at KACST. His responsibilities included operations management, Management of receiving and distributing satellite images. He established airborne LiDAR and hyperspectral-mapping division at KACST. He is heavily involved in research include the development of the use of LiDAR and photogrammetry for building 3D photorealistic virtual models of geology and manmade features and integrating them in Geographic Information Systems (GIS) for visualization and analysis. Ground and Airborne LiDAR Technology. Building, Visualizing, and Analyzing 3D Virtual Models. Remote Sensing and GIS Application. Qiu, Fang, Li, Bin, Chastain, Bryan, Alfarhan, Mohammed, 2008, A GIS based spatially explicit model of dispersal agent behavior, Forest Ecology and Management, Vol. 254, Issue 3, P. 524-537. Alfarhan, Mohammed, White, Lionel, Tuck, Dean, Aiken, Carlos, 2008, Laser Rangefinders And Arcgis Combined With 3D Photorealistic Modeling For Mapping Outcrops In The Slick Hills, Oklahoma, Geosphere e- Journal; June 2008; v. 4; no. 3; p. 576–587; DOI: 10.1130/GES00130.1. Valcik, N., Aiken C.L.V., Xu, X., Alfarhan, Mohammed S., 2009, Cutting Edge Information and Virtual Technologies for Homeland Security in the 21st Century, to International Perspectives On Crime And Justice (Book 733 pages), Chapter Twenty One, Edited by K. Jaishankar Ph.D.Published by Cambridge Scholars Publishing. Carlos Aiken, Mohamed Alfarhan, Lionel White and Mohamed Abdelsalam, 2010, Three-Dimensional Globally-Accessed Monuments Experiment (3D-GAME): The UT Dallas – Missouri S&T Effort, p. 119-129 “Heritage in the Digital Era”, Multi-Science Publishers, London. 17th Annual South Central Arc User Group (SCAUG) Student Competition Award, UT Dallas Geosciences Ph.D. Student Mohammed S. Alfarhan Wins the 2007 SCAUG Student Competition, http://www.utdallas.edu/geosciences/news/2007/alfarhan.html, 11-13 April 2007, New Orleans, Louisiana. R.M. Butler Memorial 1st Runner-Up Award for “LiDAR Technology as a Means of Improving Geologic, Geophysical and Reservoir Engineering Evaluations: From Rocks to Realistic Fluid Flow Models” as a best paper presented at Canadian International Petroleum Conference (CIPC) 2009.